So! It’s that time again! 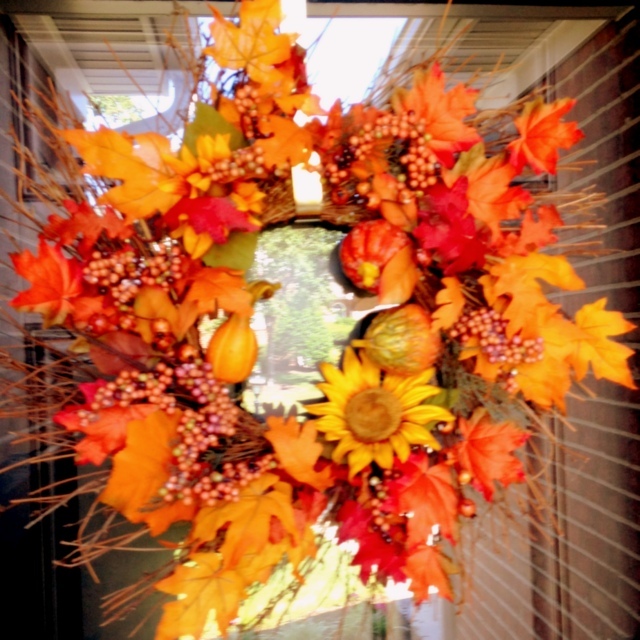 Another season sliding out the back door as we hang the fall wreath on the front door. I saw a spray of yellow leaves here and there along the parkway today. The angle of the sun has shifted. Now it makes me squint my eyes while cooking on the patio grill. Sunlight arrives a little later each day, and departs a little sooner. Just a few weeks and we will set the clocks back to standard time. I turn on some classical music, lean back and close my eyes. This is a landmark kind of thing–changing seasons. At least it feels that way at this stage in my life. September! That’s the month when I finished army basic training fifty-nine years ago–and then went to my secondary training in Long Island. I shivered in summer khakis when I stepped off the train in New York City. What a relief when they issued winter uniforms! “Autumn Leaves,” played by Roger Williams, floated in the air, along with real leaves. Fort Slocum was an island, and it was blustery. I had qualified for the Army Information School, which was more like a college campus than an army post. What a change from infantry training in South Carolina during July and August! Our training included press photography, newspaper journalism, writing radio scripts, and more. Here was a different world, one I had to stretch to fit into–geopolitics nearly did me in. But I made it. They sent me to the Pentagon after two weeks of leave. I got there just in time to be assigned as a runner for the Eisenhower Inauguration Committee. Along with that, I clipped newspaper articles in the Chief of Information’s office: anything about the Army–from all over the country–every day. It seemed like I was the only non-college-grad in the Fort Meyer South Post barracks. I went home weekends. But that’s a story for winter. Fort Slocum’s autumn leaves are a sufficient memory for the fall. It was September three years later when I entered Bridgewater College. I remember freshman orientation week. A cold front blew in for those few days. Then classes started and it stayed cold at night, but was quite warm at mid-day. The campus came alive with activities, and my mind came alive with academic challenges. I still listened to Roger Williams and “Autumn Leaves” whenever I could. September three years later was the month when my daughter was born. We were living in an upstairs apartment of a college-owned house. Life was hectic with school, four mountain churches where I was serving as a student pastor, and a new baby. I was awestruck by the immensity of parenthood, the huge responsibility to nurture a tiny bundle of gurgling joy into an adult human being. The task seemed overwhelming. I rocked her at night and sang new lyrics I’d put to the tune of a familiar lullaby: “Rock-a-bye Linda, in daddy’s arms….” Autumn leaves brushed the window pane outside. Decades later I had an opportunity to meet Roger Williams. It was at the Schuller Institute for Successful Church Leadership in Garden Grove, California. He performed during one of our worship times at the Crystal Cathedral. I marveled as he played “Autumn Leaves” that day. Later I had a chance to tell him how much that song had meant to a young GI at an army school in New York decades earlier. How do you describe fire? 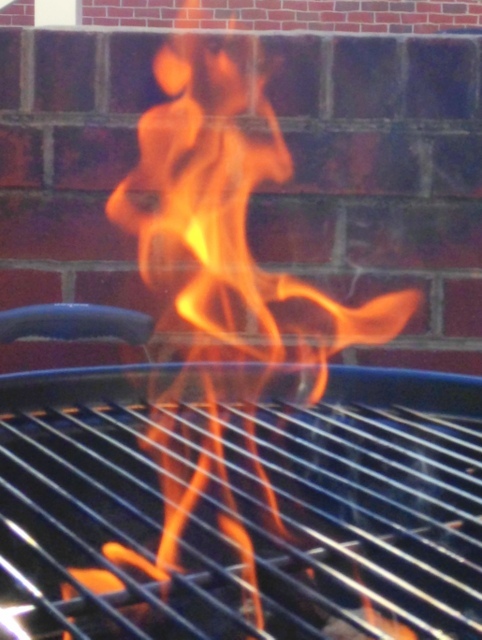 We say flames are red, but watching them jump up from my charcoal grill this evening, I saw varying shades of orange. Flames danced above the intensifying bedrock of burning coals. They were constantly changing, leaping high, contorting themselves into a myriad of shapes, physically present yet illusive. Each lick lasted only a microsecond, yet the life of each fed the energy of all. They danced on until orange/yellow heat morphed into blue/white heat with pockets of reddish glow that soon cooked delicious hamburgers. It was a dance of seasonal transition marking Fall’s rapid approach. As I watched those dancing flames it occurred to me what a parable of human life they represented. At times they were majestic and beautiful. Then they would become volatile with changing shapes, almost acrobatic. Finally they withdrew into a passive presence as they reached their stage of glowing completeness. When all was completed they shrank away into consumed dust. Aren’t we all a bit like that? We dance through life, fleetingly swelling and shrinking, reaching and withdrawing, stretching upward, and buckling down. In the immensity of time and creation, we each have our moments, intermingled with the moments of those around us. We reach our optimum movement, then morph into the next stage of being, fueling the ongoing universe. Some of us flame up brighter and more boldly than others. Some come and go so quickly they’re scarcely noticed. Yet it takes all of us to make the flame-dance of life vital, vibrant and energized. Watching the flame-dance brings to mind the magnificence of God’s creation design. We’re each here briefly, significant in our own right, essentially ineffective unless connected with others to generate community. Our moments count. We count. Each of us is essential to the whole. And my faith teaches me that the God who creates our flame-dance knows each one of us personally, and loves us unconditionally. In a moment God will allow us to flame out, so we can emerge into a more permanent and blessed existence. For the last two-and-a-half years, the tires on my car have given me great service. Never a flat. Rotated and balanced regularly. Expected treadwear of 48,000 miles/my experience just short of 47,000 miles. I’m satisfied! Now, here’s the rub. No matter how great the treadwear, the time has come when I need to replace these old tires. Will the new ones be as good as the first set on the car? What brand is best? Decisions, decisions. Solution: I’m satisfied with the old tires, so I’ll replace them with the same make and grade. Problem solved. Replacement scheduled. Going through this has reminded me of when I used to buy RETREADS to replace worn tires. It was in the 1960’s and 70’s. Those were my student years. After my release from the army, I entered Bridgewater College in Virginia’s Shenandoah Valley. We didn’t have student loans in those days. To pay my way, I served as a part-time student pastor in a circuit of four Methodist churches. I lived near campus and traveled 35 miles one way to work several times a week. Talk about treadwear! I wore down tires quickly. 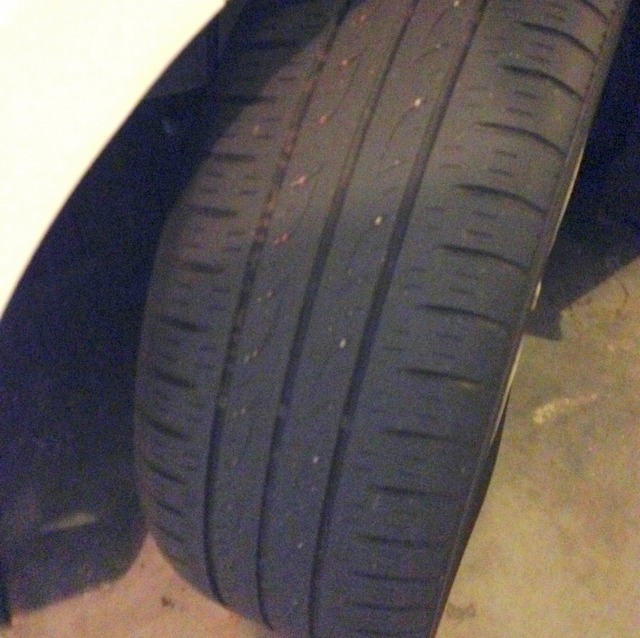 So I relied on retreads–tires that were processed so that a new tread was bonded onto an old casing. They weren’t guaranteed for anything like 48,000 miles–but they were cheaper at the time of replacement. That made sense then. I don’t know if they still make retreaded tires for cars, but I do see remnants of them from trucks and trailers on the highway. It doesn’t matter–I’m not in the market for that anymore. I like 48,000 miles! Come to think of it, tires are not the only places where I’ve had retreads in my life. Going into the ministry was a retread–I had planned to study architecture when I got out of the Army. God had other ideas. I’m glad he did! So the ministry was a retread. There were some others. In the process of getting a liberal arts education I wore out some old ideas and retreaded my thinking with new concepts and understandings. That continued in seminary–and on through the years that followed. Another retread came after I retired from the ministry. I’d been a professional artist alongside my ministry for years, so I decided to retread that into a full-time business, producing and selling my art. That put a new tread on the old casing of my life, but that wasn’t the end. A few years ago I dusted off something I’d played with for decades–the idea of writing a novel. I retreaded my retirement by becoming a writer, and now have three published novels out, along with a non-fiction book I wrote with my wife. As a writer I think I’m still running on some pretty good tread. So what’s next? What will be the next retread? Maybe it will be the retread of a new body and a fresh life in the awesomeness of God’s eternal grace. That’s not a retread, however. It’s a matter of finally getting to the state of being for which I’ve been created from the beginning! Thanks be to God. Ed Heygood headed out for his morning walk in Dinkel Island’s Crabber’s Creek Estates. 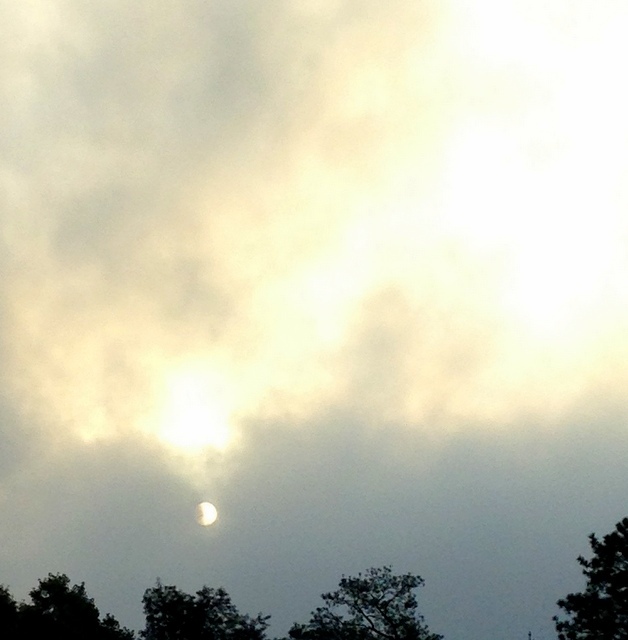 It was a humid morning with little air stirring at ground level. Not so above him. Strong air currents caused clouds of various hues and densities to form a floating screen, sometimes hiding the sun, sometimes releasing its brilliance. The drama seemed to portray an allegory for life. A word came into Ed’s mind: “Sunscreen!” As he walked he turned the word over–viewing it upside down, sideways, from the top down, from the ground up. It became for him an alliteration for the way we live our lives. The “sun” is truth, reality, shame, joy, guilt, sorrow–a myriad of labels for what goes on within us, around us, between us and others. When the “sun” gets too bright or too hot, we screen out things we’d rather not see, hear, touch, taste or contemplate: that’s SPS 50! Sometimes we try to substitute hand-hewn realities that make for a better read on things. We camouflage reality with words, images or actions that we expect will make the latest “breaking news” more palatable, or spice it up to our liking. That’s SPS 30. Other times we take in the full spectrum of reality and then shade it off with a bit of spin. That’s SPS10. How do you start your days? When the latest news breaks about a shooting, terrorism, refugee tragedies, political grandstanding at the voters’ expense–what do you do? How do you process it? What kind of sunscreen do you blow across the face of the sun (reality) in your life? “I think you’ve got something there,” said Ed.